We hosted our inaugural Tweetup last night. It’s like a “meetup” except it’s Twitter.com users (who “tweet”) that follow the official A’s feeds @Athletics and @ticketservices. A special Plaza Level ticket allowed early access to the Eastside Club before the evening’s game where guests were treated to question and answer sessions with A’s players and personalities, hosted by Kara (@karashotcorner), while nibbling on inclusive food and beverages. Two of the A’s most savvy social media users, pitchers Gio Gonzalez (@GioGonzalez47) and Brad Ziegler (@bradziegler), sat down with Kara in front of the crowd to answer questions that fans tweeted us before and during the event. A few off-the-cuff highlights from the players… When asked what other position he’d play besides pitcher, Gio said he couldn’t play infield because he doesn’t like wearing a cup. Asked about their uniform choices, Brad doesn’t wear stirrups because it’s too much gold for his taste, to which Gio replied he wants to go with an all gold uniform. Brad was asked and talked about the importance of his foundation Pastime for Patriots. After the player panel, A’s radio voice Vince Controneo (@vincebaseball), Comcast SportNet California on-air personality Kate Longworth (@KLongworthCSN), and the Twitter sensation/wife of the night’s home team starting pitcher Amanda McCarthy (@Mrs_McCarthy32) all sat down with Kara to discuss how Twitter enhances their daily lives. Vince claims he doesn’t know what he’s doing on Twitter, but clearly, as one of the few MLB broadcasters on Twitter, understands how to harness the power of social media. He uses Twitter to interact with fans and stay on top of breaking news around the league. 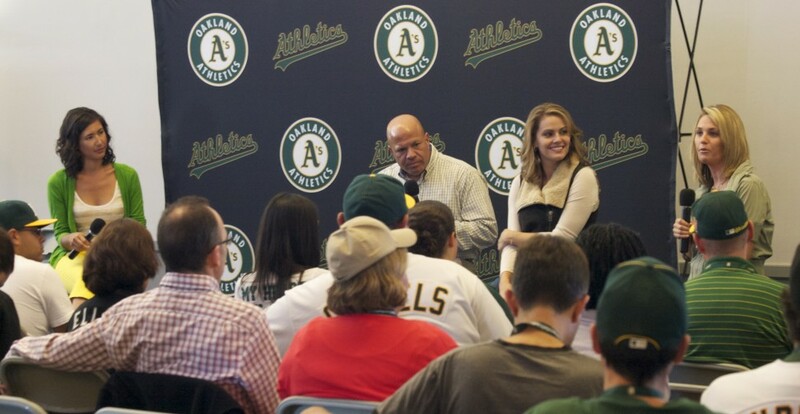 Kate, both a reporter and A’s fan, appreciates the personal viewpoint that Twitter provides fans. She recounted a recent connection she made with an out-of-state A’s fan that coined the term “Fosse Posse” and then attended his first home game in Oakland, where he got to meet Ray Fosse. Twitter provided the platform to make these connections happen. Amanda discussed the thrill of tweeting with people and then coming face-to-face, realizing the person you’re tweeting might be seated right behind you at the ballpark. 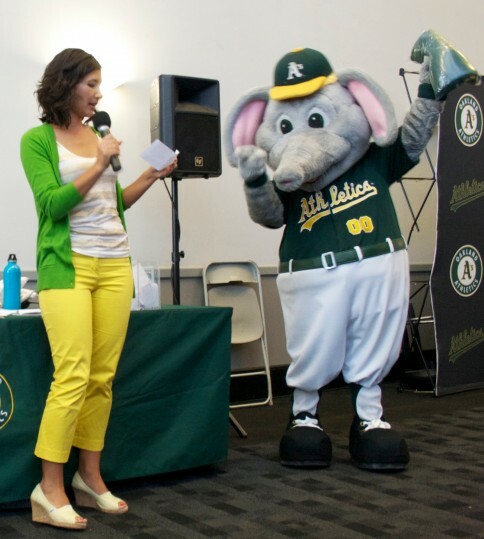 Even Stomper (@Stomper00) rolled through the Tweetup a couple times to visit with fans, assist with the giveaway raffle, and to try and push his Twitter followers over 1,000. By the end of the game he reached his goal! Thank you everyone that came out to the A’s first Tweetup. If you attended, we’d love to hear what you thought. Write us in the comments area below so that we can make the next Tweetup even better. We’ve encouraged you to follow the A’s on social media before, but for the first time new followers will directly result in a decreased ticket price. Yesterday at midnight we recorded the number of followers that the @Athletics Twitter feed. It was 18,118. 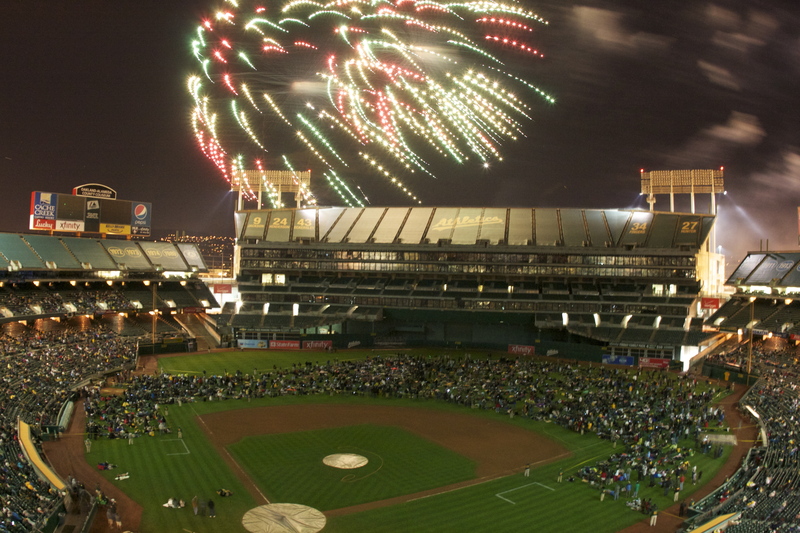 Over the next week, every 100 new followers will reduce the price of 4th of July Field Level tickets by $1. Get the full scoop. For example, if 600+ new followers (or 18,718+ total followers) are signed up to follow the @Athletics feed, then the price of the $26 Field Level ticket will drop $6 to a new cost of $20. “Follow & Save” ends Monday, June 20 at 10am PT. By 11am that morning we’ll provide the online coupon code for redemption of the new July 4 game ticket price. It’s a “Follow Friday” every day this week at @Athletics y’all! We were asked on the @ticketservices Twitter feed for the playlist from the Saturday, May 28 Michael Jackson themed fireworks show. Our pleasure to supply. This photo was taken from the third deck on a tripod. The photographer was dancing during the photo shoot. While those of us in the Ticket Operations Department are most fond of the @ticketservices Twitter handle – your official Oakland A’s Twitter feed for ticket information – the A’s have a few other official Twitter feeds, most notably @Athletics and @OaklandAs. This week you may notice a gravitation toward @Athletics and away from @OaklandAs. We’ve done this for two main reasons. First, Major League Baseball created @Athletics as an RSS feed a couple years ago, providing news updates on the Oakland A’s. @OaklandAs was also created a couple years ago as a more personalized form of communication. Some news, some giveaways, mostly general communication with fans. The hash tag “Athletics” (ie: #Athletics) is far and away more popular than #OaklandAs (apostrophes just don’t work well with Twitter hash tags). The second reason for the switch was fan confusion. Both @Athletics and @OaklandAs were deemed the “official” Twitter handle of the Oakland A’s. But @Athletics got more publication recognition because it falls in line with the rest of club handles (ie: @Angels, @Mariners, @Rangers, etc). @DodgertownUSA is doing the same by switching to @Dodgers. For these reasons we decided to make the switch to just one all encompassing main handle: @Athletics. That’s not to say that @ticketservices is going anywhere. It’s the granddaddy of all A’s front office Twitter feeds, celebrating the third anniversary of its first tweet on June 25. So follow us on Twitter. And check out more Tweeters to follow, including many Oakland A’s players, at oaklandathletics.com/connect. “Rockin’ Robin” of a past generation popularized “Tweets.” Nowadays “Tweets” are less about Bobby Day and more about the online social networking site Twitter.com. It’s difficult to avoid the discussion about and references to Twitter. Your kids are probably Tweeting, a mass of celebrities are Tweeting… are you Tweeting? A “Tweet” is a status update on the Twitter.com microbloging site that allows publishing no more than 140 characters per post. Everything from world views to how many times a user blinked in the past minute are posted… just has to be short and sweet. It’s a quick and easy way to stay connected with those you like and/or admire. 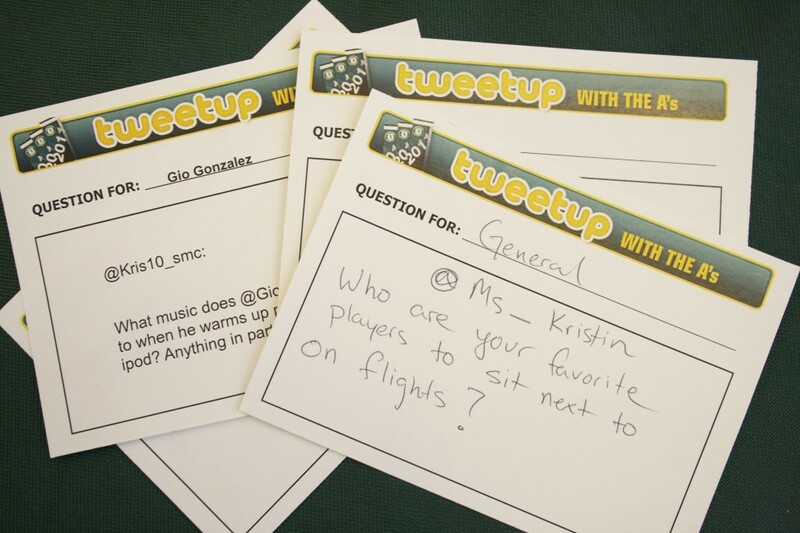 And why do we write about Twitter in the A’s Ticket Services blog? Because we’ve taken the plunge too! Actually, A’s Ticket Services has been active on Twitter for almost a year. Our first post was June 25, 2008. Trend setters anyone? We’ve certainly been more active this season, what with Twitter’s increasing popularity. Our handle is ticketservices and you can find us at twitter.com/ticketservices. On Twitter we hold contests, ask and answer A’s questions, and provide updates on A’s news- mostly from a ticket perspective. The occasional ticket discount offer- or “tweet deals”- pops up too. There are actually two official Twitter sites for the Oakland A’s. ticketservices and OaklandAs. Each account is updated by a different department at the A’s so you’ll get a different perspective from both. A great place to ask A’s related questions too. Hope you follow. Hope you enjoy. Rock on. Tweet, Tweet, Tweedilly-Tweet! Samuel on 10 Men, 11 Walk Offs! David Peters on New For 2012: A’s Season Ticket Holder Entrance! Carole on Get Your Fingers on Rollie’s Bobblehead!